The collection consists of architectural plans and drawings for construction projects (primarily grain elevators) in Ontario and Manitoba. 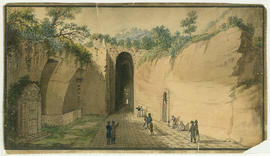 Item is a watercolour painting of The Grotto of Posillipo, Naples, now known as the Crypta Neapolitana. The site was built ca. 37 BCE, under the direction of the Roman architect Lucius Cocceius Auctus.